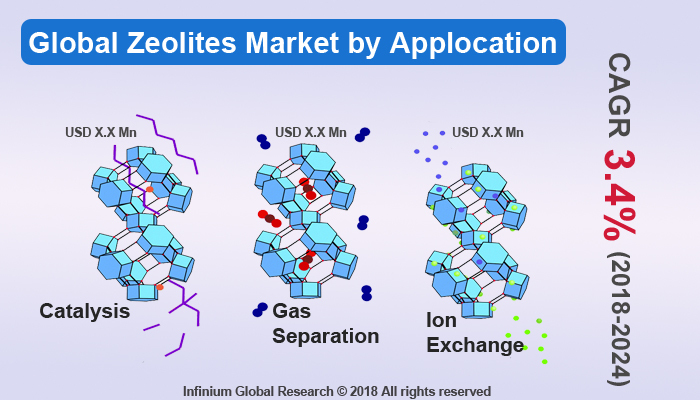 A recent report published by Infinium Global Research on zeolites market provides in-depth analysis of segments and sub-segments in global as well as regional zeolites market. The study also highlights the impact of drivers, restraints and macro indicators on the global and regional zeolites market over the short term as well as long term. The report is a comprehensive presentation of trends, forecast and dollar values of global zeolites market. According to the report the global zeolites market is projected to grow at a CAGR of 3.4% over the forecast period of 2018-2024. Zeolites are hydrated aluminosilicate minerals with crystalline solids structures made from interlinked tetrahedral of alumina, silica, and oxygen. Zeolites are normally obtainable in both natural and synthetic forms. Synthetic zeolites are used mainly as detergent builders, catalysts, and absorbents/desiccants, while natural zeolites are used for feed additives, soil amendment, water treatment, environmental uses, and construction. Zeolites have various special properties as compare to many other materials. Zeolite offers high melting point, resist high pressure, insoluble in water and other chemical solvents, and many other properties. Detergents are one of the dominant application for zeolite. Zeolites have exquisite ion exchange property so both natural and synthetic zeolites are widely used in the formation of detergents. Rapidly growing detergent industry is the key factor driving the growth of zeolite market across the world. In addition, increasing refinery output and rapidly growing demand for adsorbents are likely to boost the growth of Zeolites market over the forecast period. However, rising adoption of zeolite-free detergents and the presence of suitable alternatives such as Aluminophosphates are expected to restrain the growth of zeolite market. Moreover, the rising water treatment and detergent industries are projected to create several opportunities for the zeolite market in upcoming years. Among the geographies, Asia-Pacific is the largest and fastest growing region in the zeolite market owing to the presence of many detergents and water treatment industries. The tremendous growth of the water treatment industry is likely to boost the Zeolites market in this region. The report on global zeolites market covers segments such as applications and product. On the basis of applications the global zeolites market is categorized into catalysis, gas separation, ion exchange, and others. On the basis of product, the global zeolites market is categorized into natural zeolite and synthetic zeolite. The countries covered in the North America region include the U.S., Canada, and Mexico; while Asia-Pacific includes China, Japan, India, South Korea, Malaysia, and among others. Moreover, Germany, U.K., France, Spain and Rest of Europe are included in the European region. The U.S. drives the growth in the North America region as it is the largest market in the region. The Asia-pacific region offers a substantial potential for the market growth owing to rapid growth in markets such as India and China. The APAC region is projected to experience growth at a CAGR of x.x% over the period of 2016-2024. The report provides profiles of the companies in the global zeolites market such as Arkema Group, BASF SE, Zeochem AG, Grace Catalysts Technologies, KNT Group, Chemiewerk Bad Köstritz GmbH (CWK), Interra Global Corporation, Zeox Corporation and UOP LLC. The report provides deep insights on demand forecasts, market trends, and micro and macro indicators. In addition, this report provides insights into the factors that are driving and restraining the global zeolites market. Moreover, IGR-Growth Matrix analysis given in the report brings an insight on the investment areas that existing or new market players can consider. The report provides insights into the market using analytical tools such as Porter's five forces analysis and DRO analysis of zeolites market. Moreover, the study highlights current market trends and provides forecast from 2018-2024. We also have highlighted future trends in the zeolites market that will impact the demand during the forecast period. Moreover, the competitive analysis given in each regional market brings an insight on the market share of the leading players. This report will help manufacturers, suppliers, and distributors of the zeolites market to understand the present and future trends in this market and formulate their strategies accordingly.